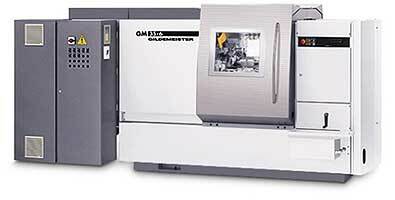 Gildemeister Italiana SPA (Gital) is among the leading Italian producers of machine tools and is the world leader in the manufacture of multi-spindle automatic lathes. The company also produces other types of lathes that are used in the manufacture of small-sized mechanical components, along with related accessories. In 1999 Gital exported its products mainly to Germany (24%), the USA (12%) and France (4%). Multi-spindle lathes accounted for 51% of 1999 revenues; universal and other lathes, 34% and other, 15%. Whether conventional turning machines or CNC High-Tech turning centers, simple manually operated milling machines or fully automatic universal machining centers, the user will find a machine tailor-made for each job within the production program of DMG, the company’s own sales and service company. With its subsidiaries GILDEMEISTER Drehmaschinen GmbH, GILDEMEISTER Italiana S.p.A., DECKEL MAHO GmbH Pfronten, DECKEL MAHO Geretsried GmbH and DECKEL MAHO Seebach GmbH, the company covers the complete spectrum of turning and milling machines. The marketing highlight will be the EMO exhibition in Hannover, which is to be held on the EXPO site. Here, at the industry’s largest trade fair worldwide, DECKEL MAHO GILDEMEISTER will be presenting virtually its entire product range. Innovative new developments will further consolidate her leading position in turning, milling and laser technology. Trend-setting laser technology will, in 2001, make a significant contribution to group sales for the first time. With the networking of her machine’s open control systems and software modules Gital will be able to break new ground as a service provider for Gital customers with products such as the DMG Net Service and CNC Net Training.